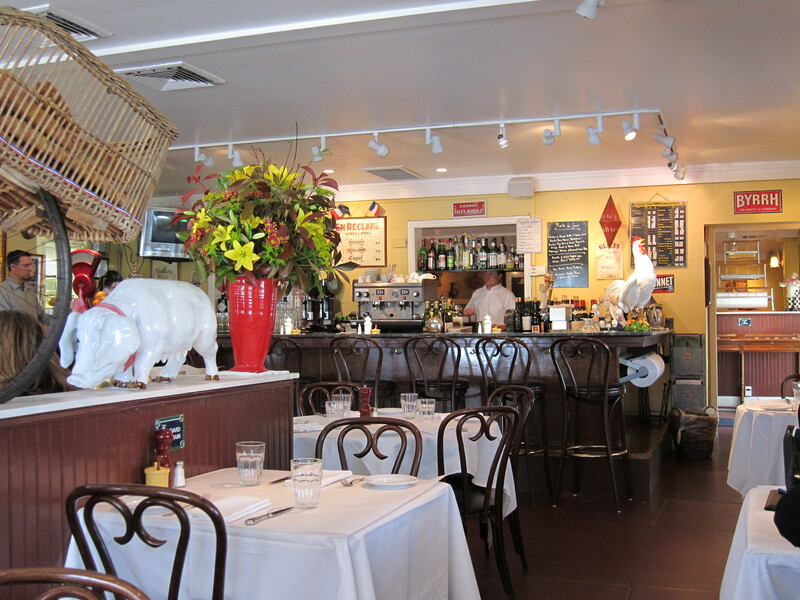 I can’t count the number of meals I’ve enjoyed at Bistro Jeanty over the years. Only the old, now defunct Tra Vigne (not the pale imitation that still survives under that name) etched so many meals on my memory. Bistro Jeanty’s pike quenelles in lobster sauce, fresh tomato sauce under puff pastry, warm lamb tongue salad, smelts with aïoli sauce, salad with lardons and poached egg are a few of the dishes I’ve eaten and remembered. I went back recently for the first time in almost two years. Instead of reading it as a sign that the bistro was mired in history, I rejoiced to see on the menu many of the dishes I remembered. My friends and I ordered a variety of dishes to share. I confess the meal disappointed me. That is not at all to say that it was bad. But the zip has gone out of the food. For instance, we ordered risotto with grilled rabbit loin, morels, peas, and truffle oil. The rice was creamy, the truffle oil fragrant without dominating. The round cylinders of rabbit loin were pale. They may have been in the same kitchen as a grill, but that’s probably as close as they came to it. The seasoning was too subtle. In other words, the dish sagged. The flavor could have been much brighter. However, it was still a good dish. In contrast to the insipido risotto, the roasted bone marrow in sauce bordelaise with toasted bread was rich, bright, and savory. The quenelles in lobster sauce are still satisfyingly guilt-inducing. It’s a dish you allow yourself to have once a year so you don’t regret eating a dish as rich as that. Bistro Jeanty will have to deteriorate much further before I give up on it. The servers treat you discreetly and with unobtrusive warmth. The ambiance may strike you a little like a French bistro theme park, but it’s extremely comfortable and the interior is bright and welcoming. All the place needs is a little goosing.